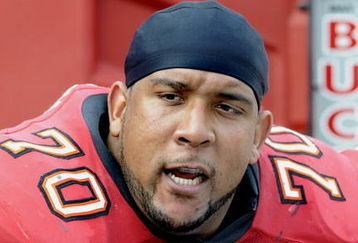 Led by Donald Penn, the Bucs offensive line has likely been the team’s strongest unit. Joe once had a college English professor who bragged he had only given out three “A’s” in his career in education. Joe can’t remember what grade he got from this guy, but Joe does remember he passed — that’s what counts, after all. The biggest thing Joe remembers from this class was a drop-dead gorgeous, leggy blonde who used to sit next to Joe (poor girl). Joe was reminded of this old professor when he was reading the grades dished out by Woody Cummings of the Tampa Tribune for a mid-season report. Offensive line: This group has been solid, but the Bucs need more from its most veteran unit. Grade: C.
Whew. If anything, Joe believes this has been the strongest unit on the team. Davin Joseph should be in the Pro Bowl this year, provided he stays healthy. Donald Penn has simply locked up opposing right defensive ends, Jeff Faine has been solid when he has played, and Jeremy Zuttah has been strong. Joe would likely give these guys an “A-” if he had to grade. Considering these guys had to deal with injuries and there hasn’t been much of a drop off, that’s big. Penn and Joseph have been very good. But with the injuries and turnstile Trueblood on the right side, this is just about right. Some of the stat guys show that Freeman has been one of the most pressured QBs in the league. Trueblood is an abomination at RT and Faine/Zuttah are average to below average players. Penn has been a very good leftie and Joseph is playing up to his contract and measurables. I think C is fair, though I’d probably give them closer to a C+. They are not an A- O-line until they can cut down on the penalties. I would give them a B though. I agree, a B- is where I would grade them. Graham ran well behind them, as has Blount. Josh has been pressured too often though. I must be seeing something completely different. Trueblood deserves an F for his play, and when you want to establish the run, but don’t have a RT worth his weight in salt, then yea, your offensive line grades out to a C.
Tels you how crappy the Bucs are this year when “the strongest unit on the team” is a C. An A- offensive line can run the ball at will on anyone, this team can’t do that consistently. Lets get something straight here Joe. NO ONE on this average at best team deserves to go to the pro bowl. Anyone that thinks so is just being a straight up homer and is looking at this team through the pewter and red colored glasses that Dominik, Raheem and the Glazers gave out at the end of last season. As far as the grade goes, it’s right on.